Left: Poster from the camp. 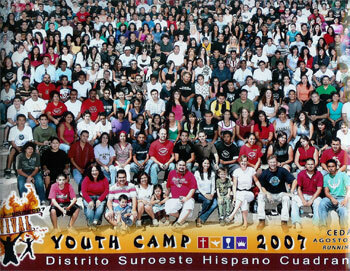 Right: Group pic with us at bottom in 1st row, third and fourth from right. It was a very busy summer ministry-wise, and we rejoice for all the fruit and transformation we have been privileged to see. After doing numerous ministry trips to Mexico, as well as ministering in various places in California, we ended the summer with a big blessing, preaching at the Summer Youth Camp for the Hispanic Southwest District of the Foursquare Church. 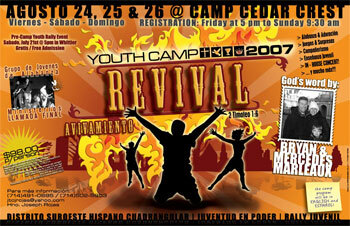 Over 30 churches and approximately 400 youth, ranging in ages between 12-29, took part in this life-changing event. We had a very powerful time ministering as the main speakers at every meeting during the camp. It was an awesome time up in Big Bear, California where the retreat was held in the refreshing climate of the mountains. With all the people who were coming from as far as Las Vegas, San Bernardino County, San Fernando Valley, South San Diego, Los Angeles, and Orange County, as well as other places, it was definitely a busy but very blessed time. 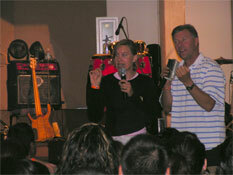 Left: Bryan preaching as Mercedes interprets. 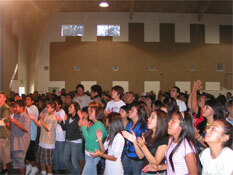 Middle: The youth getting into the worship. Right: Praying for a young brother in the Lord who was touched radically by the power of God. We had plenty to keep us busy at every session, preaching and then praying for lots of people, which would go on for hours every time. This continued in meeting after meeting and on one particular day of the camp we had three different meetings in one day, but the Holy Spirit gave us strength beyond our expectations to fulfill His purposes there and it was a great joy to see so many lives impacted by God's presence and grace. The grace and glory of God was evident and moved awesomely with great power at every meeting and continued to be poured out in more intensity as the camp progressed. So many who came were gloriously filled with the Holy Spirit, reignited in their faith, empowered to serve the Lord, and healed and set free to follow Jesus without reservation. 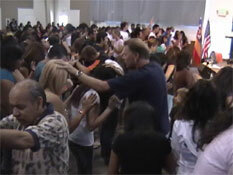 There were also a lot of people there who rededicated themselves to the Lord as well as those who received Christ too. There were a number of deliverances from afflicting spirits and healing too. It was a very, very awesome and powerful time in the Lord. Left: Praying as youngsters flood the front. Middle: Ministering as the Holy Spirit moves. Right: Patrick laying hands on a fellow keiko (that's Hawaiian for kid). In fact, many of the leaders publicly shared how this was the best camp they had ever had, and to date we have received many testimonies of lives changed, people healed and delivered, as well as souls saved. We fully rejoice and praise God! It was truly a blessed time in awesome interaction with Christ, up on the mountain, where we were able to experience His glorious grace and power. We know many lives will never be the same because of the way the Lord moved so powerfully. God has also continued to move powerfully in Mexico and other places as we’ve been ministering in churches, outreaches, crusades, and other settings. We just recently ministered in Fullerton, California, in a youth rally/outreach and had a very powerful time as the Spirit of God filled with power those who came, releasing His grace, love, and healing touch. That same power moved also in Ontario when we ministered there and Jesus's healing touch blessed and filled people there, as well as retrieving a few lost sheep at both places. We were also just at a celebration for radio programmers in Tijuana and asked to perform a song and say a few words and do the closing prayer. But like many times, when the Holy Spirit gets involved it turns into something much more. The Spirit of God began to fall in power during all this and the time turned into ministering the filling, empowering, and encouraging work of the Holy Spirit over those who were there. Some fell over from just a seeming closing prayer and other people began to cry profusely under the healing power of the Holy Spirit's touch as the Lord lifted heavy loads off and healed emotionally and physically many who were there. God filled many who had been struggling with discouragement in their new ministry endeavors with His encouragement. All this from a song and a prayer which turned into much more and went on much longer than anticipated, but was a glorious time as we invited the Holy Spirit into the middle of what we were doing. Hallelujah! Bryan throwing some spray in Nor. California. Click on the picture to check out Bryan's testimony. The Lord also continues to use the vehicle of surfing as a link to reaching out to the lost and ministering to others; you can’t reach out to the lost if you’re never around them. The Lord continues to use it to bring witnessing opportunities that have lead to praying for, helping out, and even leading others into the Kingdom. We’ve been blessed at times to get the opportunity to take a surf break after ministering in Mexico and other places, which has often lead to divine appointments. It has also been a link to encourage other believers. The Lord truly continues to bless us and reward us as we serve Him with it. Like just recently, we were driving on the freeway when we felt led by the Holy Spirit to stop by a particular surf shop and check out a new wetsuit for Mercedes. We were just wanting to take a look and maybe hope for a miracle since the prices are quite high these days. I remember the days of being sponsored, so paying full price in a shop feels not only foreign but is a drain on already-tight funds. Well, God answered that cry for a miracle as we came upon just one top-of-the-line wetsuit that had been unusually and incredibly marked down from $250 dollars to just $29 dollars because they had changed the name of the new model and this had the older model’s name on it. It fit Mercedes perfectly and we could handle $29 a lot better than $250 and jumped on that insane and divine deal. I (Bryan) got a deal like that a little while back when the owner of a shop gave me a $175 wetsuit for $25 because the manufacturer forgot to put the logo on it. Turns out that God is a pretty cool sponsor Himself!! Hallelujah!! Check out some of our surf-related videos and hear about Bryan’s surf career crashing into the Baptism of the Holy Spirit and then being called to the ministry. Also, check out some of our “Holy Ghost Surf Stories” from around the globe with radical divine appointments, so wild they will truly blow your mind—not blow your brains out as one interpreter in Norway "eloquently" put it while preaching there—rather, they will shock you in the radical way in which God can intervene into our human circumstances. You can also watch and listen to them for free on our podcast. Check it out!